One easy way to expand on the invite and carry the theme through, is in a favor tag. Favors are such a fun little way to say thank you to your guests for taking time out of their busy lives to celebrate with you. These little favor tags and matching labels turned simple jars of olive oil into an adorable compliment to the rest of the Coletti Spaghetti Party. I can create favor tags and custom stickers to coordinate with any invite! My daughter Coletti's first birthday party is definitely one of my favorite themes. Coletti is the type of kid that always had (and still has) food all over her face. She has a definite LOVE of food that she inherited from her foodie parents (sorry, honey, you may weigh 400 lbs. someday.) It is only fitting as an Italian girl, that one of her first solids was pasta and she inhaled it. So we started calling her Coletti Spaghetti and it stuck. In fact, so much so, that now at almost three, if you say her middle name she corrects you and tells you its Spaghetti. So when it came time for her first birthday, we knew we had to have a Spaghetti party. If there is one thing I've learned from joining an Italian American family it is that food is very important and is the center of any gathering. So it was fitting that our Italian Princess' party was completely centered around food - LOTS of food. Starting with appetizers - antipasti, bruschetta, and caprese salad and finishing the main meal with spaghetti, of course. Guests washed down all that food with their favorite "bevande" - Italian beer, Italian soda, Italian water and of course wine. We set up our living room like a little Italian restaurant for the kids to eat at. After dinner, we enjoyed a gelato bar, cannolis from Sugar Sisters, and "Spaghetti" cupcakes, (recipe from Hello Cupcake Cookbook) paired with espresso. My husband has inherited quite the collection of espresso sets, so it was fun to get to use these! Although eating was the focus, we did enjoy some Italian games like Bocce and our favorite card game, Briscola. For decor, I wanted to use the green and red from the Italian flag, but didn't want too much of that and definitely didn't want a lot of the red checkers. So I tried to use lots of wood accents, wine crates for displays, and pictures of our baby girl. My good friend, Mollie Wetta, arranged some beautiful flowers to tie it all together. 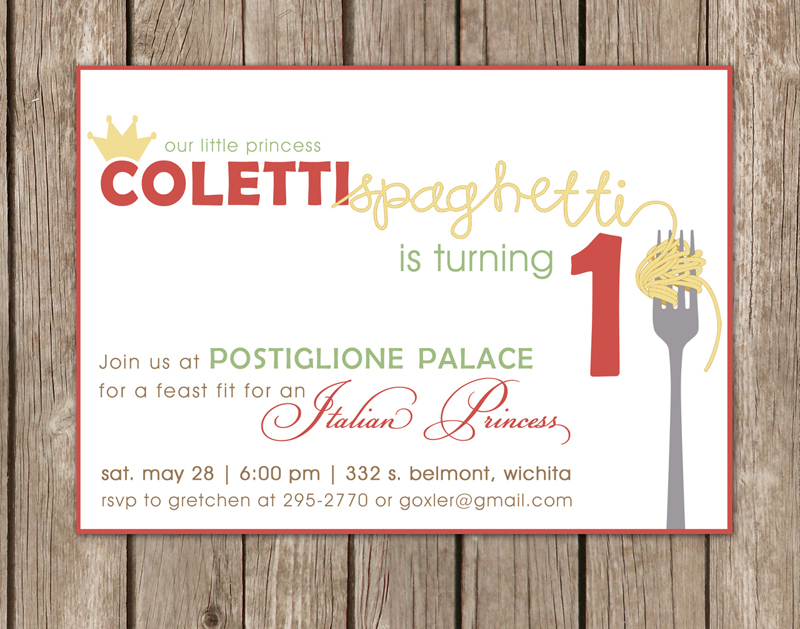 I also created a Coletti Spaghetti sign out of chipboard letters and beige yarn to mimic the invite. The focal point, though, was the Colitti family crest. My mother-in-law had it framed for us, and it was fun for all of our friends to see the history behind Coletti's name! It was a fun party to throw, and Coletti Spaghetti enjoyed all the spaghetti! Wedding Wednesday - Goodbye Unity Candle! Guest Feature - Written by Faith Geilenfeldt of Bel Amour Events. The unity ceremony holds so much meaning in a wedding and is one of the oldest wedding traditions! It is a public display of two becoming one! As a wedding coordinator, I can’t tell you how many times I have heard brides say “I don’t want to do a unity candle or sand ceremony...I want something that is different!” Well ladies... here are a few unique options. Pour different colors of paint over a canvas, and let the colors run together. After the wedding, you will have a fun piece of art to hang in your home! Incorporating children? Just add additional colors and let them help in the pouring. During your ceremony, place your wedding vows or letters your have written to each in a wooden box, along with a bottle of wine. Nail or lock it shut and on your first anniversary, open the box, pour a glass of wine and read your letters or vows to each other. Incorporating children? Write a set of vows to your children from you, as a couple. After reading the vows to them during the ceremony, place them in the box along with your other vows or letters and let them assist in nailing or locking it shut. Pour two different kinds of wine together into one bottle. Have the bottle corked and save it to open on your anniversary. The party was in the "Enchanted Forest" located at the back of my aunt's 30 acres. After the guests arrived, we took a carriage (i.e. tractor pulling a trailer) to the enchanted forest. Along the way guests saw little fairy tale vignettes and my mother was the tour guide on the "enchanted tour." The kids expressions during the tour were so priceless and a little creativity and a LOT of imagination on their part made it truly magical. 1st Stop: 3 Little Pigs - A pile of sticks, a pile of hay and a little brick house made from a cardboard house a few cardboard bricks and brick paper. 3rd Stop: Cinderella's Carriage - after it had turned back into a pumpkin...it was after midnight! 4th Stop: Wicked Queen's Hideout - apples scattered around a mirror where the Wicked Queen had been making the poison apple. 5th Stop: Troll Bridge - a bridge with a few giant footprints gave all the little ones quite a spook...but most were brave enough to run across! 6th Stop: Fairy Trees - strobe lights with tulle scattered in a few trees and a couple little fairy ornaments. We told the kids to keep an eye out for fairies and their little imaginations were already going and they were "seeing them" everywhere before we even hit the fairy trees. 7th Stop: The 7 Dwarfs Diamond Mine: a big pile of dirt, a few plastic jewels and a couple picks. 8th Stop: Rupunzel's Tower: My aunt has an amazing tire climb so we added a "house" at the top and a really long braid (which took 3 bodies to braid) all the way down to the ground. We also caught a glimpse of Little Red Riding Hood in the woods and drove by Crocodile Lake. I shared the first part of this party last week. If you've ever thrown a party for toddlers you know that their attention span is short so you have to have a LOT planned. So for the Fairy Tale party I packed the party full of activities to keep them interested. Cardboard Castle and Markers - as we waited for all of the guests to arrive kids played and colored in the castle. Mad Hatter Tea Party - a mini table and chairs with hats and mini teacups and pots where kids could play and pretend. Enchanted Tour and Carriage Ride - The party was in the "Enchanted Forest" located at the back of my aunt's 30 acres. So to get there, guests took a carriage (i.e. tractor pulling a trailer.) Along the way guests saw little fairy tale vignettes and my mother was the tour guide on the "enchanted tour" - which will be outlined tomorrow in more detail. Snow White and the Dwarfs Diamond Dig - Kids took their treasure boxes to the mine (sandbox) and search for diamonds - Each kid got to dig up one jewel for their box. Pin the Braid on Rapunzel - Our version of pin the tail on the donkey. Story Time - While the kids ate cake they listened to a story in the story time arbor. How do you turn popcorn into a "fairy tale" food? Sprinkle with pixie dust, of course! Or in this case, Wilton Pearl Dust. I couldn't think of a more perfect favor for a Fairy Tale Party than a fairy tale book. However, I didn't have a lot of luck finding cute and cheap fairytale books at the bookstore. So I turned to my favorite place: Etsy. There I found these amazing vintage fairytale books. I made bookmarks that matched the invites and adorned them with fairy tale themed charms I also found on Etsy. The books are from the etsy shop: 1SweetDreamVintage and the charms were from LePriss.